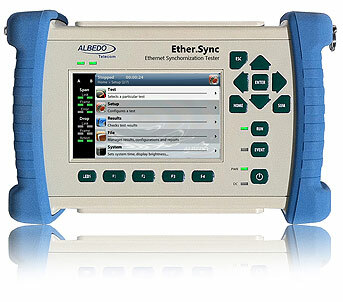 ALBEDO Ether.Sync is a field tester for Synchronous Ethernet equipped with all the feature to deploy and troubleshoot both GbE and SyncE infrastructures, supporting standards such as Y.1564 & Y.1731 to verify the QoS and SLA to quickly and easily validate and troubleshoot ANY Ethernet service. Ether.Sync adds new features for the installation and maintenance of new Synchronous technologies while conserving everything required for the commissioning and troubleshooting of Gigabit Ethernet. Master Clock operation on each port using internal/external ref. AT.ESync.HH Ether.Sync hand-held tester. Battery operated. GBE testing with synchronization options including dual 10/100/1000 Mb/s RJ-45 electrical ports, dual optical ports, QoS statistics, RFC2544 performance test, BER test, continuous / burst / ramp / random traffic generation, traffic statistics, error analysis, connectivity test (PING, Trace Route), analysis filters, event insertion, endpoint and pass-through operation modes, graphical display of events, report generation and export. Includes AC/DC adapter, transportation bag and one RJ-45 patch cable. SFP transceivers not included. AT.ESync.Mstr Multistream Test. Generation over eight independent traffic streams. Eight analysis filters for each test port. AT.ESync.1564 eSAM (ITU-T Y.1564). Test of up to 8 services simultaneously. Set up of CIR, EIR and policing rate. Per stream quality objectives. Measurement of Information rate (IR), Frame Transfer Delay (FTD), Frame Delay Variation (FDV), Frame Loss Ratio (FLR) and Availability. AT.ESync.IPV6 IPV6 test. Decoding and analysis of IPV6 datagrams. IPV6 traffic statistics and events. IPV6 packet filtering. Top IPV6 source and destination address (with Network Search option). AT.ESync.MPLS MPLS test. Generation of a single or double label according RFC 3032. Configuration of TTL, Traffic class, Label . Filter selection rules by Label and Traffic class field. Frame analysis of MPLS Packets. Top LSPs (with Network search option). AT.ESync.WIRE Cable test. Wiremap with open and short circuit detection. Measurement of distance to fault. Crossover / straight cable detection. Measurement of the cable skew. AT.Esync.POE Power over Ethernet test. PoE / PoE+ end point and pass through as per IEEE 802.3af and IEEE 802.3at with voltage and current measurement. AT.ESync.SE SyncE clock emulation. Synchronization testing according to ITU-T G.8261, G.8262, G.8264. Ethernet line frequency (MHz), offset (ppm), drift (ppm/s). Analysis / Generation of ESMC messages. External reference clock input 2048 kbit/s, 2048 kHz, 1544 kbit/s, 1544 kHz, 10 MHz, Synchronous Ethernet and 1 PPS. External reference clock output 2048 kHz and 1 PPS. AT.ESync.SEW SyncE wander test. Synchronous Ethernet TIE / MTIE / TDEV measurement. Synchronous Ethernet wander generation. AT.ESync.PTP IEEE 1588v2 / PTP clock emulation. PTP master and slave emulation. PTP passive monitoring. PTP message classification and analysis. PDV analysis. External reference clock input 2048 kbit/s, 2048 kHz, 10 MHz and Synchronous Ethernet. External reference clock input 2048 kbit/s, 2048 kHz, 1544 kbit/s, 1544 kHz, 10 MHz, Synchronous Ethernet and 1 PPS. External reference clock output 2048 kHz and 1 PPS. AT.ESync.PTPW IEEE 1588v2 / PTP wander test. PTP TIE / MTIE / TDEV measurement. AT.ESync.OCXO OCXO time reference. High performance internal oscillator replacing the standard time reference installed in the application board. AT.ESync.NS Network Search. Automatic detection of up 16 most frequent streams listed by IPV4, VLAN and MAC. AT.91 Sync adapter. Smart Serial to RJ45. External reference clock input 1 PPS. External reference clock output 1 PPS. Additional external reference clock input 2048 kbit/s, 2048 kHz, 1544 kbit/s, 1544 kHz, 10 MHz. Additional external reference clock output 2048 kHz. AT.ESync.GPS GPS receiver and antenna. 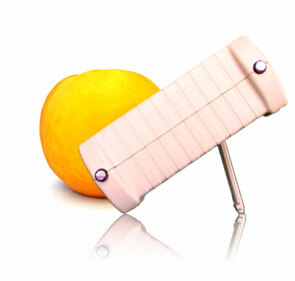 Provides absolute time reference for synchronization tests through the GPS satellite network. Connection is through RJ-45 male interface. AT.Wi-Fi.RC Remote Control. Based on VNC for Windows and Linux. Ethernet/IP remote control that duplicates the tester graphical user interface in a remote computer. AT.ESync.Cert Certificate of calibration. Accuracy calibration certificate, executed only when is sold and before its shipment. AT.ESync.Check Periodical Unit Verification. Includes board test verification (Calibration, Internal Frequency), test port verification (Ports A / B / C: Ethernet, SFP, unbalanced E1, balanced E1, VF Port , DTE / DCE Ports) and analog verification (level port A / B / C, line attenuation, jitter error, pulse mask).